The GX-33 Leopaldon (Leopardon) & Spider man (レオパルドン&スパイダーマン)set is yet another amazing entry in Bandai’s Soul of Chogokin line. There are a couple of unique things worth noting about this toy. It is the first regular release SOC to be paired with a toy from another series. This toy comes with a Soul of Sofubi Spider man figure. 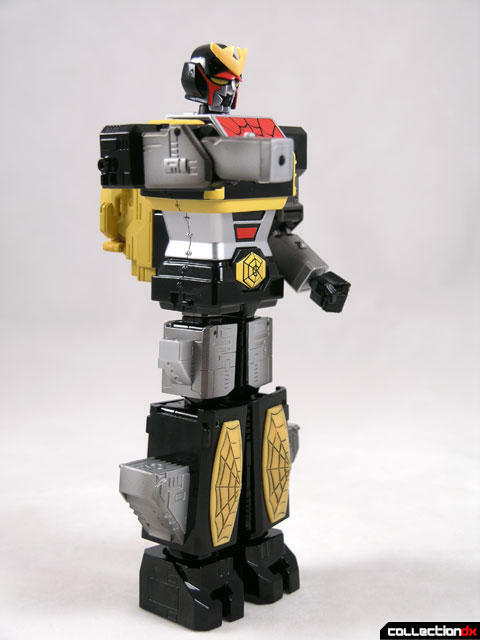 I say the first REGULAR release because there was a limited edition Mazinger Z that came with a SRIA Mazinger Z, but that was a Toys Dream Project exclusive. This is also one of the first SOC’s that has actually felt like a toy first and a collectable second. It is so much fun to play with, and so durable, that I had expert toy reviewer Nathan B take a look at it in this video review. 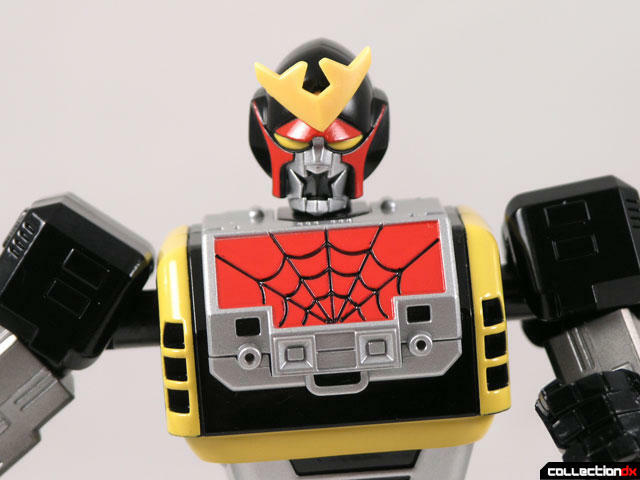 Spiderman has a super robot? Back in 1978, Toei made a deal with Marvel Comics that allowed Toei to develop properties based on Marvel Comics for four years. The first show they did was Spider-Man (Toei no Supaidâ-Man). 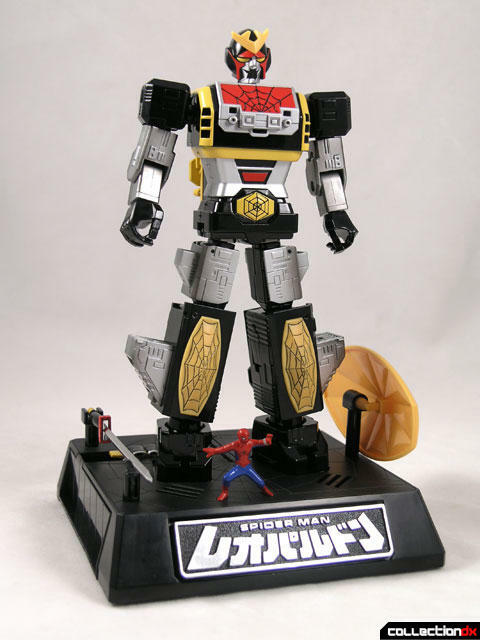 This version of Spider-Man differed greatly from the Marvel comics version, as Spider-Man now had a super car called the Spider Machine, and a giant spaceship; “Marveller” that transformed into the super robot Leopaldon. Marveller, incidentally, was named in homage to Marvel Comics. 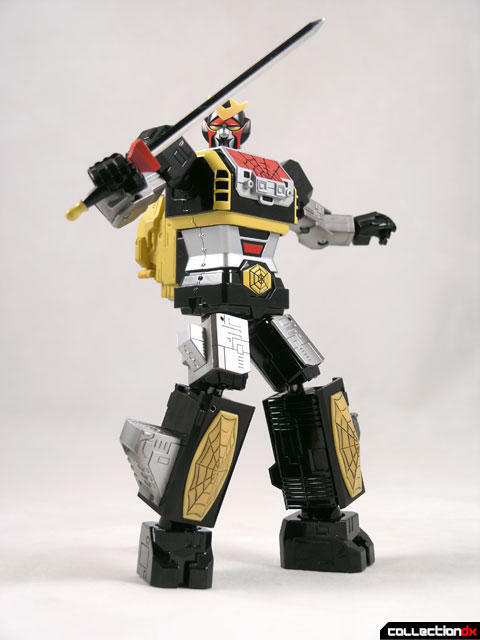 The decision to include a giant robot was made by co-producer Bandai, who went on to create several different toys of the character. 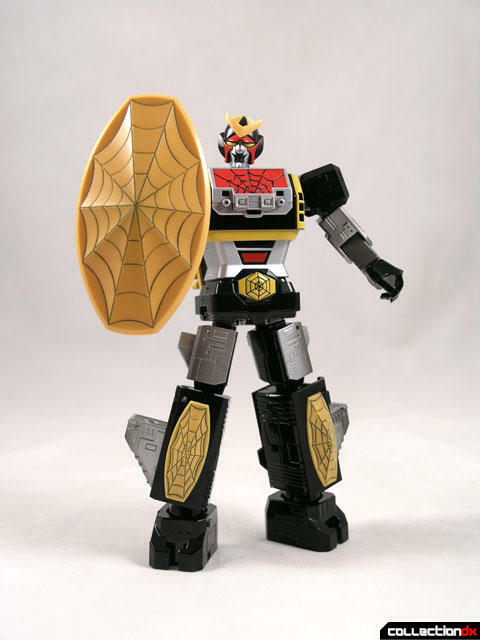 The toy most familiar to US audiences would be the Godaikin Leopardon. The packaging for this release is really nice; it has a window box with a see-through panel that shows the Soul of Sofubi Spider man figure. Inside you get that tray, the Styrofoam box that holds Leopaldon, trays for the accessories and a box for the stand. This SOC comes with a manual, but what sets this manual apart is a nice retrospective look at other Leopaldon toys. While not complete, it offers a glimpse of the history of Leopaldon toys. 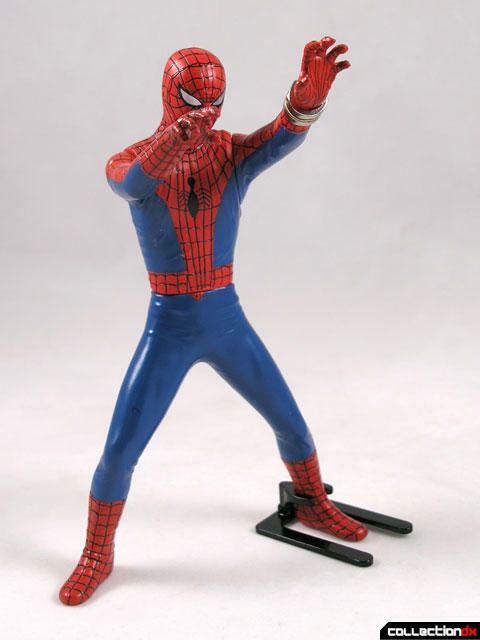 The Soul of Sofubi Spider man is nice enough, standing about 6” tall and made out of soft vinyl. The arms and waist are moveable, but it’s really meant to stay in this one pose. The wrist communicator is made out of metal, and so is the small stand that secures to Spider man’s leg. The paint is really nice, but there is a smudge of yellow paint on the back of the leg on mine. 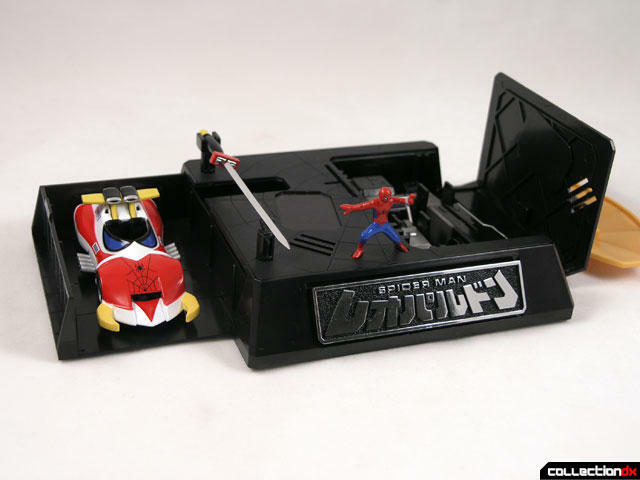 Also included is a small ¾” Spider man figure that can be placed on the base for display. 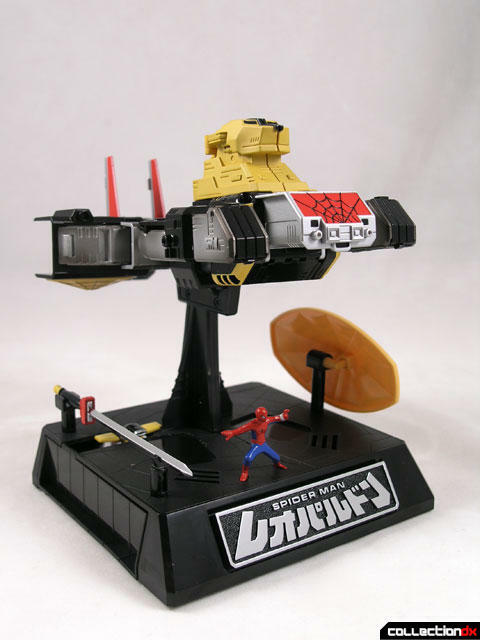 In the Japanese show, not only did Spider man have a giant robot, he also had a sweet ride, the Spider Machine GP-7. This vehicle would dock in the back of the Marveller spaceship before it transformed into Leopaldon. The Spider Machine is about the size of a Hot Wheels car, maybe a little bigger. The body is made out of diecast metal and the tires are rubber. It’s a nice little car, and would have been at home in the Charawheels line. 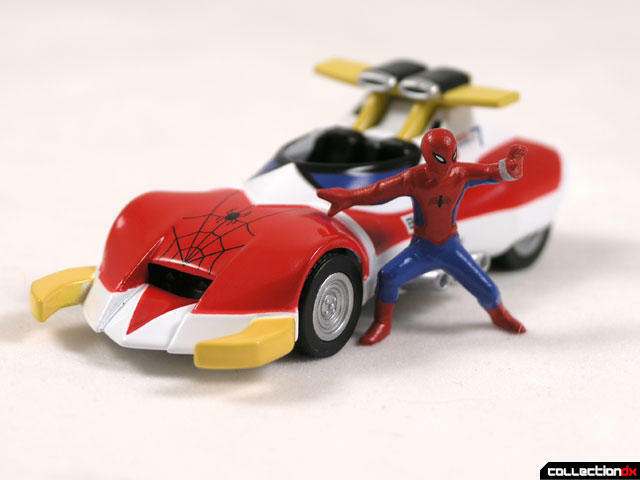 The vehicle seems to be in scale with the smaller Spider man, but he does not fit in the cockpit. 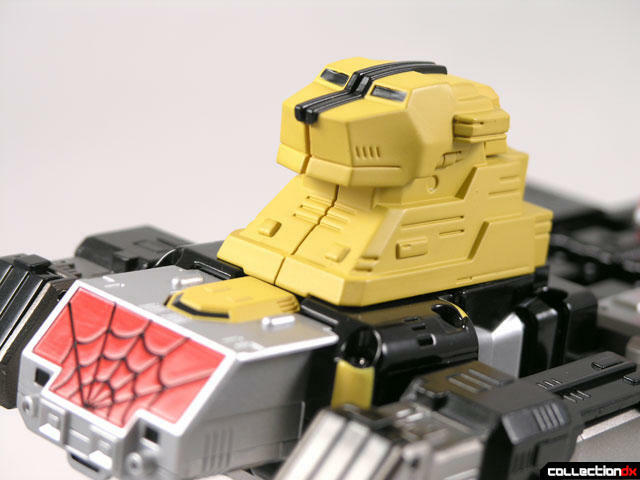 Also included is a mini Spider Machine that fits into the back of the Leopard head. Leopaldon is really a beautiful toy. It is just loaded with fun, durable, and heavy. 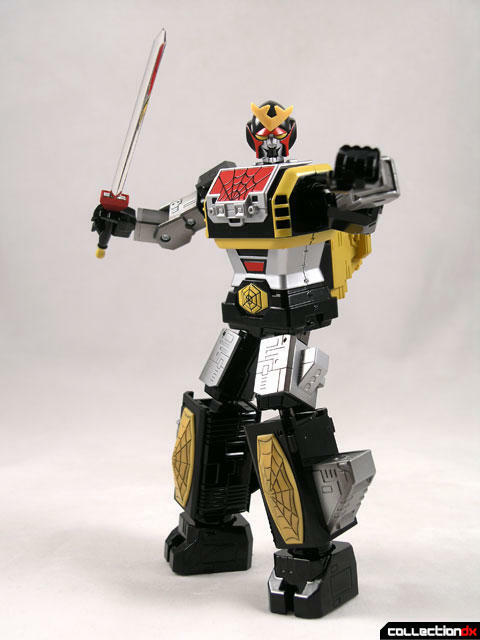 It is not so much a re-imagining as a re-design of a classic toy. 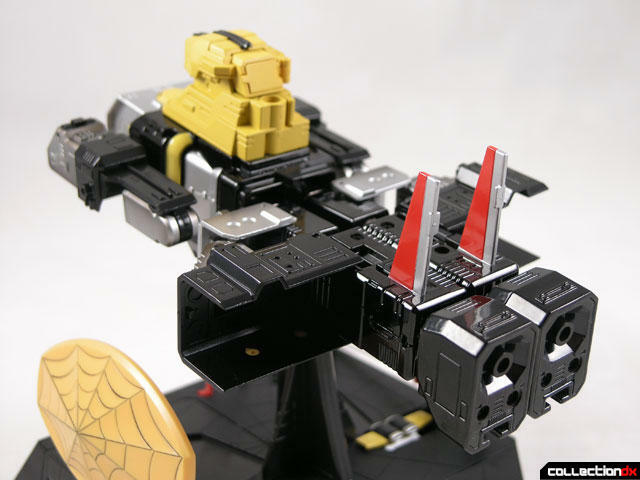 It is basically just a refinement of the original Chogokin toy released in the 80s. In robot mode, Leopaldon is highly articulated, including moveable shoulders, elbows, wrists, neck, upper chest, hips, knees and feet. There is no waist joint. The head features a launching crest that is fired by a button on the back of the head. This has a hair-trigger, so be careful you don’t lose the part – you only get one. Leopaldon actually comes with two sets of arms – one set is for posing and one set is for transforming. The arms swap out pretty easily. The transforming arms feature diecast shoulders and firing fists. These arms are not as poseable due to the need for them to transform. The poseable arms are more versatile, and are better suited for everyday display. There is no metal in the poseable arms. Two sets of hands are included – closed fists and hands that hold the sword and shield. Only the closed hands can fit during the transformation process, but you can attach the launching post to the back of either hand. The weapons are Leopaldon’s sword and shield. Each can be grasped in one of the open hands. The sword is unfortunately plastic. The legs are mostly diecast metal with plastic covers that swing out for transformation into Marveller. The hip joint is nicely done, with the joint at the front of the leg instead of the center. This gives Leopaldon a wider range of motion without worrying about paint chips. This is a very easy transformation. First the arms need to be swapped out to the transforming arms. Unfold the arms and tuck the lower arms into the arm assembly. Split the Leopard head on the back in half, and then rotate the head and upper chest back. Close the head. On the inside of one of the lower legs there is a small panel. Pressing one side of this panel allows it to rotate and reveal a peg. Snap the legs together with this peg. Swing out the upper leg armor until it goes into the groove into the waist. Then, swing out the lower leg armor and it clicks into the upper leg armor. Finally, pull up the two wings that are in the back of the lower legs. The stand the second stand to feature compartments to hide all the accessories. The Spider Machine resides in a slide out bay, while the extra arms rest in a spot with a flip up top. The sword rests on 2 points, and the shield is secured by its handle. Two indentations indicate where Leopaldon’s feet go, and there are small footprints for the small Spider man. Spider man could have benefited from a peg or something to keep him in place. The stand also comes with an alternate platform to display Leopaldon in Marveller mode. While I am not a huge Leopaldon fan, I really like this toy a lot. It seems like Bandai is finally “Getting it”. They have taken a classic design with a great transformation and brought it into the modern era of engineering. It’s not at all “fiddly”. It retains the feel of the original toy – it is everything the original wanted to be. 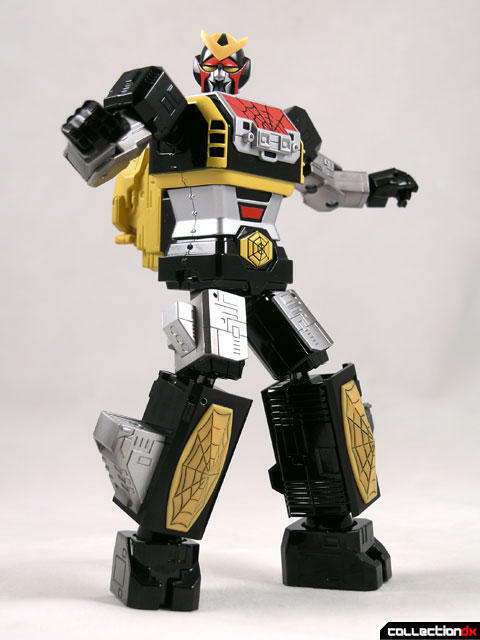 It also helps that Bandai is now doing SOC’s of newer robots. The transition from the GA-01 Mazinger Z Chogokin to the GX-01 Mazinger Z Soul of Chogokin was shocking. But by the time Popy did the original DX Leopaldon, technology had advanced. Having the stand that hides all the accessories, adding extra toys (the Spiderman vinyl, the GP-7) are all steps in the right direction. Hell, this toy even shoots things, something that fans have been demanding for years. 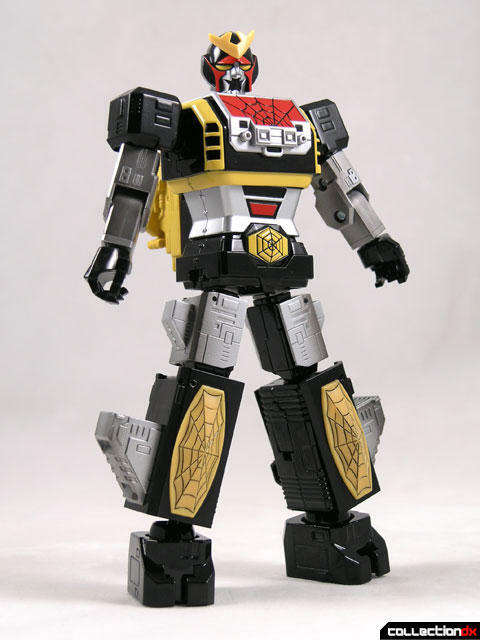 The SOC GX-33 Leopardon is in stock and ready to ship at Betatoys.com (as of the time of this writing). Don’t miss out on this great SOC. Excellent job on the review by you and Nate. I really need to start actually opening and inspecting my SOCs. I have this, but I had no idea it had a stand to display in Marveller mode. Nate is a great reviewer. Nate is a great reviewer. it's awesome to see the excitement through his eyes. It reminds me why I love this hobby! Shooting fists Rule! I think I'm going to get one from ebay for my child too. I used to love hot wheel cars. I bet I will like this one. The lack of metal in the poseable arms is a GOOD THING. Metal would risk dragging them down!